April 2018 strikes gave the message to Assad that the volume of strikes will increase if he uses chemical attacks once again. But the very same message tells Assad that he is quite secure if he satisfies with killing his own citizens with weapons other than chemical weapons. The suburb of Douma near Damascus witnessed a brutal chemical attack on April 7th. Seventy-eight people lost their lives due to the attack and the number of the wounded exceeds 100. The blood samples suggest that chlorine gas and an unnamed nerve agent were used in the attack. 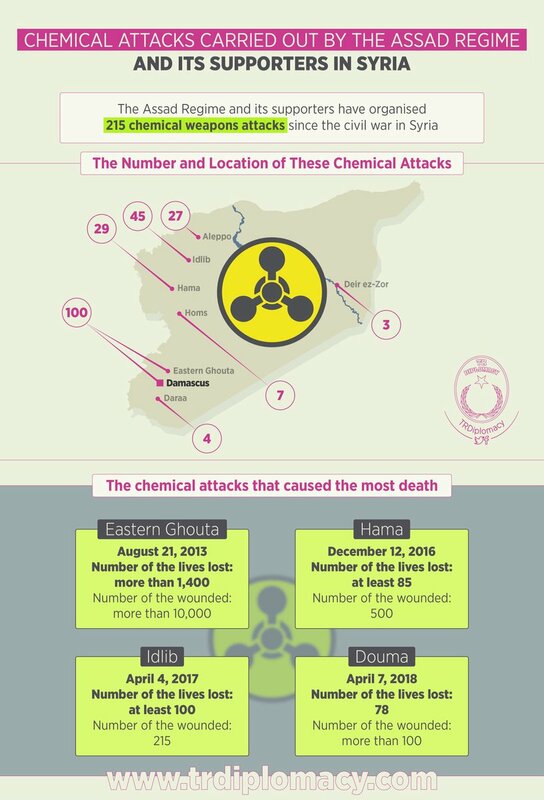 The signs also indicate the Assad regime for the perpetrated attack, as his regime has a long record of using chemical weapons indiscriminately against the rebels and civilians in rebel-held towns. Further, for actors other than Assad, using chemical weapons in the outskirts of Damascus is not an easy thing to do and using it against Assad’s enemies is not a smart thing to do. Syria has long been a bloodbath in the midst of chemical attacks, heavy bombardments of civilians in Aleppo, Eastern Ghouta, Raqqa, and so on. As the death toll in the Syrian Civil War has passed half a million, the world seems to have gotten used to the pain and despair in Syria. Thousands of civilians dying under heavy shelling has become the new routine of Syria. Deaths under bombs do not even make headlines anymore, just like in its sidekick Yemen. Life in Syria, as in Yemen, in normal conditions is nasty, brutish, and short. When you ask school kids to name some organic chemicals, you hear fructose or glucose, which tend to be the first world problems in the “normal” world. Yet, the answer to the same question might well be nerve agents or chlorine in Syria. While the world got used to seeing blood and tears in Syria, nerve agents that kill Syrians still make the world nervous. There is one thing that might still poke the world’s attention to the despair of Syrians and Assad seems to have been doing that one thing: using chemical weapons. U.S. President Trump does not have a good record of respecting civilian lives either as we saw in the U.S.-backed PYD offensives in Syria. But I guess what counts as crossing the red line is not how many civilians are killed but how. More, chemical weapons are the answer that the U.S. does not like to hear. Trump, in response to the Douma attack, tweeted full rage calling Assad an animal and promised to make him pay a big price. Nevertheless, as days passed after the Douma attack, mixed signals came from the US. Would the US hit Assad? Analysts found it highly likely. When would the attack take place? According to the signals coming from the DC, Paris and London, it would be sooner than later. Would it be enough to topple down the Assad from power? That was the big question. And now we know the answer is no. The strikes did not aim to end the Assad’s brutal regime but just to deter another instance of chemical attack. In an earlier occasion of the chemical attack in Khan Shaykhun, the U.S. had launched 59 Tomahawk cruise missiles from the Mediterranean Sea and hit the Shayrat Airbase around this time last year. Yet, hitting regime-held military bases in such a limited way has proven to be ineffective. It cost Assad some soldiers and some weaponry and equipment, but Assad did not have shortage of replacements with the ongoing Iranian and Russian support. Hence, the earlier strikes last year this time did not prevent Assad from committing brutality again and the most recent one on Friday night will not. As a response to the U.S.-led alliance strikes, we might see one change in the way Assad commits brutal acts. April 2018 strikes were stronger than the U.S. strikes in April 2017. The message for Assad is that the volume will increase even more if he uses chemical attacks once again. However, the very same message tells Assad that he is quite secure if he is satisfied with killing his own citizens with weapons other than chemical weapons.